We've already established that Funky Buddha has a thing for kooky ingredients that they are mystically able to incorporate into good beers. Now it's time to take a look at a more unassuming take on a classical style. Sure, it's got oats and lactose, but those aren't particularly unusual in a big imperial stout, so this is about as close as it gets. Beer Nerd Details: 9.5% ABV bottled (22 ounce bomber). Drank out of a snifter on 7/15/16. 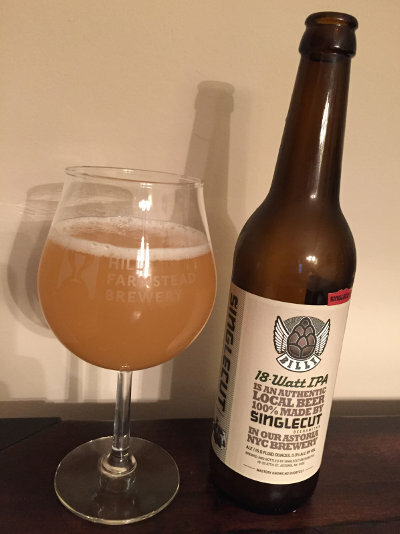 Bottled on 11/18/15. Many thanks to Kaedrin beverage compatriot Steve for slinging this my way. More southern Florida goodies will be had in the near future, for sure, so stay tuned. Beer Nerd Details: 4.9% ABV bottled (375 ml waxed and capped). Drank out of a flute glass on 7/16/16. Bottled: October of 2015. Batch: 002. Nice, let's check in on them in another three years to see where they're at. Or, you know, we could try and do it before then. Only following the orbital cycles will tell. Beer Nerd Details: 6% ABV bottled (750 ml capped and corked). Drank out of a tulip glass on 7/15/16. I've got the "Dark" version of Forest Ghost in the pipeline as well, though I may end up sharing that one with some friends. 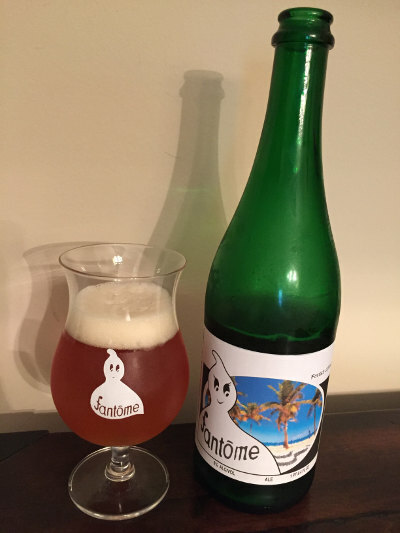 Always looking for more Fantôme! Rex Stardust, lead electric triangle with Toad the Wet Sprocket, has had to have an elbow removed following their recent successful worldwide tour of Finland. Flamboyant ambidextrous Rex apparently fell off the back of a motorcycle. "Fell off the back of a motorcyclist, most likely," quipped ace drummer Jumbo McClooney upon hearing of the accident. Plans are now afoot for a major tour of Iceland. And thus did Monty Python birth the name of alt rock heroes, Toad the Wet Sprocket, in an old sketch called "Rock Notes". Apparently the band was a big fan of Python and couldn't settle on a name, so they just snagged this one. It was meant to be temporary, but it just stuck. 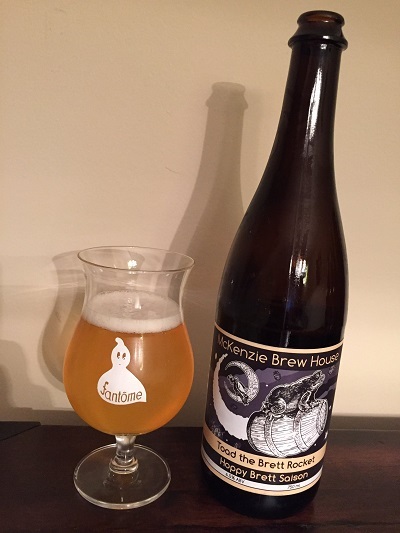 McKenzie Toad the Brett Rocket - Pours an almost clear golden yellow color with a finger of white head. Smells very nice, citrusy hops, vinous fruit, earthy Brett. Taste starts off sweet, hints of white wine, lemon peel, citrusy hops, a bit of tartness, then it moves on into more funky, earthy Brett territory, light but lasting through the finish. Mouthfeel is well carbonated, medium bodied, and lightly acidic, very refreshing summer spritzer type of thing. Overall, this is another winner, though perhaps not quite as great as Hallowed Ground, it still earns an A- in my book. Er, blog. This is a blog. Beer Nerd Details: 6.5% ABV bottled (750 ml). Drank out of a tulip glass on 7/8/16. Released: 6/28/16. It's nice to see that older local breweries are still managing to do interesting things, and I will most definitely be snagging more McKenzie bottles whenever Nate puts them out. Remember the days when anything Belgian, even American imitations of such, was noteworthy? Alright, maybe you don't, but I spent a goodly portion of my youth pining for generally unavailable Belgian abbey ales and so on. Even earlier in the days of this blog, you could see wildly inflated ratings for well made dubbels and tripels. These days I'm so addled by juicy milkshake IPAs, tropical fruit hops, funky brett saisons, tooth-enamel-stripping sours, and bourbon barrel aged wonders that taking a step back and pondering a simple Belgian style tripel actually feels novel and refreshing. Simple, but I should add: not easy. Most American takes on the Tripel style are a little too sticky sweet, not dry enough, and/or not carbonated enough. These styles are flavorful, but not in a way that is easily masked by adding craptons of hops or coffee or whatever the adjunct of the week is... Belgian beers really get their character through fermentation and yeast, and that's not as easy as it sounds. There's a delicate balance that those Trappist Monks over in Belgium seem to have mastered. 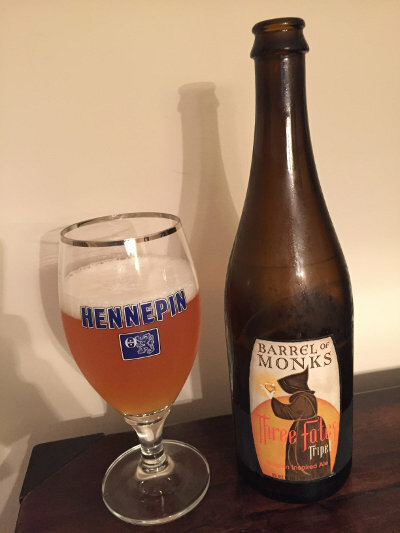 The occasional American take works well, and of course we like to explode the style with Apple Brandy Barrel treatments and souring bugs and whatnot, but those things don't really count, do they? Beer Nerd Details: 9% ABV bottled (750 ml). Drank out of a goblet on 6/25/16. Thanks again must be given to Kaedrin beverage compatriot Steve for slinging this my way. I may need to acquire some more of these fellas wares. 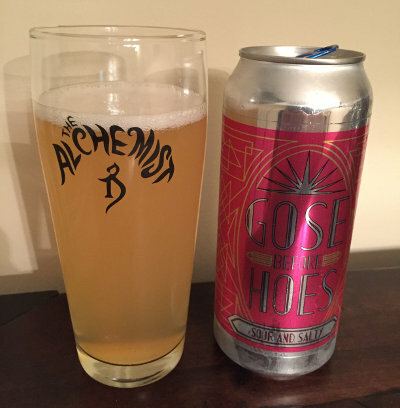 Gimmicky beers with kooky ingredients can get old really fast. The problem is that it's really difficult to incorporate some of this stuff into a beer without either A) overpowering the base beer, B) disappearing into the base beer, or C) making you feel like it was constructed in a chemical lab. But when done right, such schemes will make you wonder what sorcery the brewers hath engaged in to make the beer taste like that. 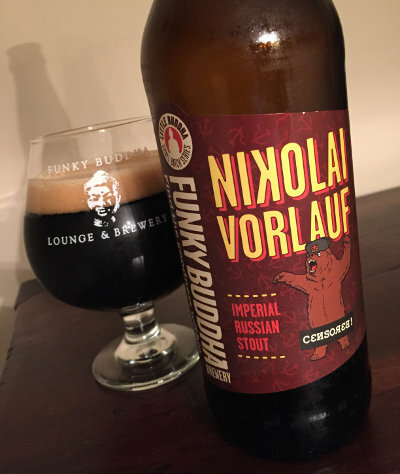 Funky Buddha doesn't always manage this feat, but they are amongst the best in the business when it comes to incorporating disparate and sometimes bizarre flavors into their beer. Last Snow, a coconut coffee porter, is astoundingly well balanced and delicious (only my general aversion to coffee holds it back, and honestly, even then I've grown to love this on subsequent tastings). Beer Nerd Details: 9.5% ABV bottled (22 ounce bomber). Drank out of a snifter on 6/24/16. Bottled on: 4/21/16. Many thanks to Kaedrin beverage compatriot Steve for hooking be up with some Southern Florida goodies. You will be seeing more from Funky Buddha on here in the nearish future. Man, what's going on in NYC these days? This is the third brewery we've covered in just the past few months (granted, these breweries have been around for a while and it's not like I'm discovering them or anything, but still) and they seem up to par with their brethren at Other Half and Grimm. I've been a little lazy on the uptake with these things, but I think that's come to an end. Beer Nerd Details: 5% ABV bottled (500 ml). Drank out of a charente glass on 6/24/16. Bottled: 6/10/16 (I think that's what the label sez). Yeah, so I think we'll be seeing more from these folks in the coming months, so stay tuned. Beer Nerd Details: 10.8% ABV bottled (375 ml caged and corked). Drank out of a snifter on 6/18/16. Bottled: 02/23/16. 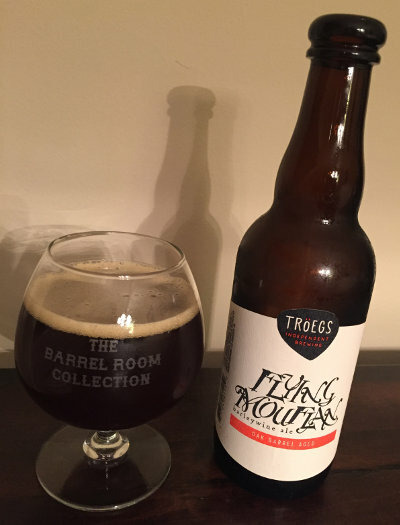 Tröegs Barrel-Aged Flying Mouflan - Pours a deeper, darker amber brown color with a finger of off white head. Smells good, less in the way of fruity malt but the slack is picked up with hops, again the barrel character is light in the nose, but it's there, imparting some of that booze, oak, and vanilla. Taste again plays up those hops, a little dankness here before the booze, oak, and vanilla kicks in... Mouthfeel is medium to full bodied, well carbonated, perhaps a bit less smooth, but still with the warming alcohol. 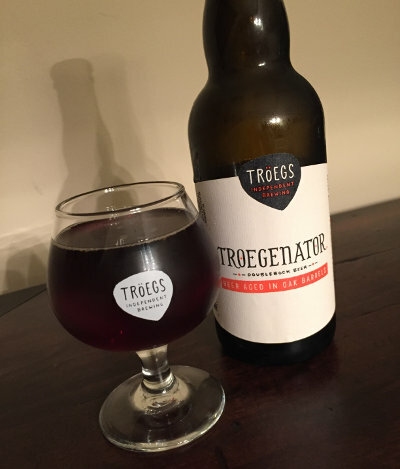 Overall, this is very nice, but far from a top tier BA barleywine, and honestly, I think I might prefer BA Troegenator... I could still give it a weak B+ though, and I thoroughly enjoyed it. Beer Nerd Details: 11.7% ABV bottled (375 ml caged and corked). Drank out of a snifter on 6/19/16. Bottled: 03/17/16. Now they just need to put Impending Descent into barrels (and maybe amp up that ABV to original Scratch offering levels before that) and I'll be a happy camper. Regardless, I'm excited to see what comes out of the Splinter series in the coming months and years. Beer Nerd Details: 4.4% ABV canned (16 ounce pounder). Drank out of a willibecher glass on 6/17/16. Can released: 5/28/16. 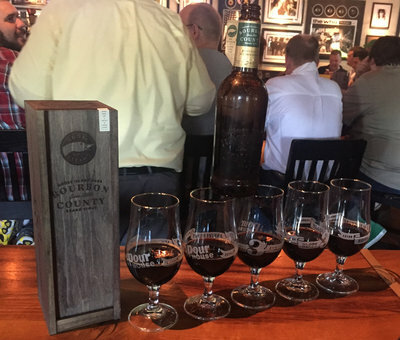 One of the most famous white whales in the beer nerd world is Rare Bourbon County Brand Stout. Released in 2010, this sucker took the base Bourbon County beer and aged it in 23 year old Pappy Van Winkle barrels for two years. At the time, neither bourbon nor beer were as crazy as they are now, so these expensive bottles were actually on shelves for a bit before their reputation caught up with them. 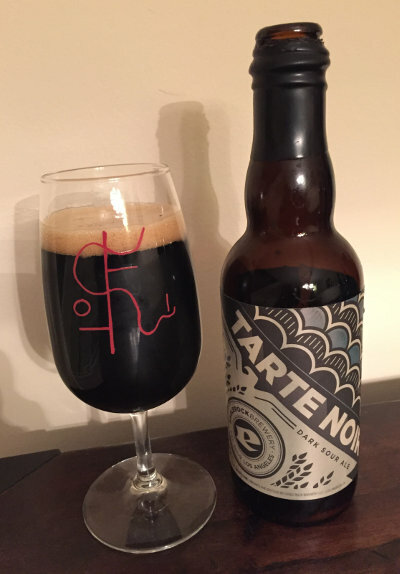 It is arguably considered the best stout ever made. Despite being called "Rare", there were quite a few of these bottles (the name is more about the aging process than the bottle count), so they became one of the most valuable commodities on trading boards. I have, alas, never gotten a taste of that original bottling of Rare, but Goose Island has gigantic balls and went ahead and slapped that label on another beer last year. Now, living up to that reputation has to be excruciating, but Goose came up with an interesting successor at the least. Heaven Hill found a group of bourbon barrels in their warehouse that had been aging for 35 years*. For the uninitiated, bourbon is never aged that long. I won't get into details, but apparently it's possible for bourbon to get over-oaked and nearly undrinkable because of that. It didn't make sense to me either, but then I drank some over-oaked 20 year old bourbon this one time and now I get it. I'd also guess that 35 years of the Angel's Share would really knock down what's left in that barrel (for reference, the 16 year old Stagg lost 84% of its volume to evaporation, so imagine what happens over 35 years). As a result, the bourbon was never released (at least, not to the public), but Goose Island thought it might make for a nice heir to Rare. So they got their hands on these 35 year old barrels and filled them with Bourbon County base beer, aging them for two years (regular Bourbon county is aged for around 8-12 months). Then they went all out on the packaging (you guys, even the oak box this thing comes in smells fantastic) and sold these things for $60 a pop during last year's November release. Once again, there were a fair amount of these guys out there, but spread out across Goose's now very large distribution footprint. Also, beer dorks are a few orders of magnitude more obsessive these days, so the one place I knew was getting some in the Philly area had people lining up early on Thanksgiving night for the Black Friday release. It was something I didn't expect to get ahold of easily, and indeed, it's trading pretty well these days and the secondary market is pretty bullish too. Enter local chain of beer establishments, The Pour House. For their third anniversary last Thursday, they broke out a case of Rare and would sell them for $85. It was unannounced too, so the crowds were bearable. This is indeed quite pricey, but we got a free glass out of the deal, it's a fair and typical bar-level increase on the $60 sticker price, far below the secondary market value, and when you split it across 5 people, it's pretty reasonable. And oh my, was it worth it. Beer Nerd Details: 14.8% ABV bottled (500 ml capped and boxed, 3-4 ounce pour). Drank out of a tulip glass on 6/9/16. It was a great event, and I didn't even mention the best part. Everyone who came got entered into a free raffle, and guess who won? Yep, I'm a lucky SOB and now the proud owner of a bottle of my own. I will, naturally, have to share this with some friends at some point, but I'm quite happy to be in such a position! * The marketing line here is that they "discovered" these "lost" barrels, which is just the latest in a long line of bourbons that have used this excuse to jack up prices lately. Either these distilleries are just blowing smoke or they have completely incompetent inventory management practices. In this case, at least, the bourbon wasn't released, indicating that maybe they really were lost, but still.